Most editing packages include a range of different transitions, which you can use creatively when you’re editing your film. By choosing the right transition, you can add a lot of meaning or style to your work. A straightforward cut is the obvious form of transition, and therefore the most common. The vast majority of transitions in film are cuts, where one shot changes instantly to another. A cut is quick and unfussy, so it naturally leads us to assume continuity; the action is happening in a continuous, linear timeframe. To achieve a cut, you simply place two shots next to one another in your timeline, although you have to be precise to ensure you have fluid continuity of the action. Ideally, a cut is a transition that your audience won’t even notice. You can also deliberately use a cut to disorientate your audience, for instance showing repetitive clips where the action ‘jumps’, seemingly missing time and/or distance out in-between. This is a style you’ll find used in art or avant-garde films. This can work really stylishly, but be sure you want to achieve this effect or you risk it looking like a bad editing job. Fades usually appear as “Fade to Black” or “Fade to White”, but most editing programs also enable fading down to any colour. This usually signals the beginning or end of a scene, or of a narrative ‘moment’, for instance you could choose a “Fade to Black” to signal the end of the day or a “Fade to White” to signal the start of a dream sequence or a memory. A fade over a POV shot can give the impression of a character sleeping or even dying. 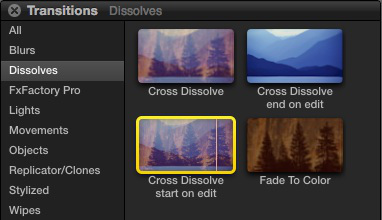 A dissolve transition takes two shots and blends them frame by frame into one another over time. This usually indicates a passing of time, or a changing of location. It’s used a lot in montage sequences. You can play with the speed to enhance this effect; a very long dissolve takes more time and tells us that time is passing slowly. You can also experiment with dissolves to create connections in your narrative. For instance, dissolves that move from one character to another usually highlights that they share something in common, such as a particular emotion or parallel experiences. Wipes move one shot across into another, often using patterns or shapes as part of the transition. This can be used to give the impression of different scenes happening simultaneously, or signal that the film is taking place in chapters or episodes. This is technique that is used in music videos, and also famously in Star Wars. We’d recommend especially judicious use of a wipe, as they can come across as cheesy. If you do plan to use a wipe, we’d also suggest making them a regular, consistent feature so that they contribute to your overall style in the film. You might also find a bank of animated or graphic effects in your software. These take your shots and manipulate them into shapes or masks that then move around the screen. These come in all shapes and sizes, common examples include irises, mosaic tiles or panels that swap places. These can be fun to play with, but they are rarely found in professional films because like a wipe, they can appear silly or cheesy. Think about these ones if you’re planning a spoof or a photo slideshow, but be careful if you want your film to be taken seriously. Whatever transition you’re planning to use, think about the effect you want to create for your audience. Try adjusting the speed, or the length, and have a look at the rhythm of your shots, as the timing and the pace of your editing choices can also have a huge impact on the style and meaning of your film. This entry was posted in Filmmaking Guides and tagged editing, filmmaking tips, transitions. Bookmark the permalink.